In light of the “Me Too” movement and related current events, attorneys can expect an increased likelihood of questions from their clients about how to handle workplace complaints. 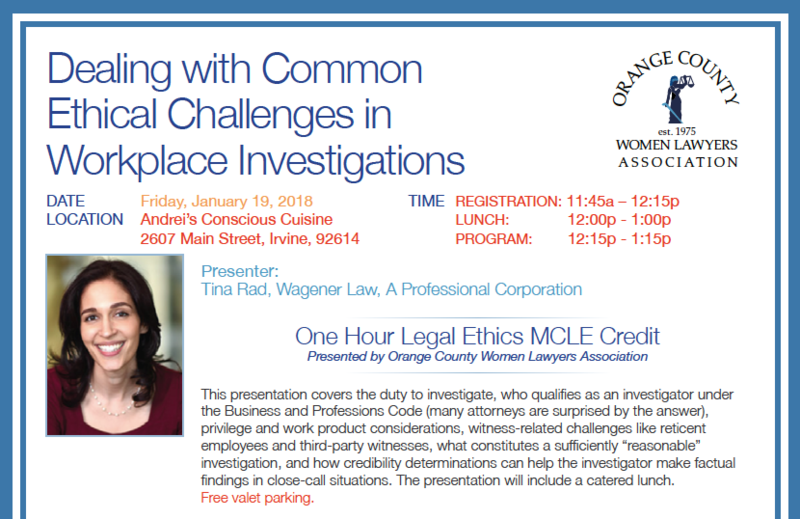 This presentation covers the duty to investigate, who qualifies as an investigator under the Business and Professions Code (many attorneys are surprised by the answer), privilege and work product considerations, witness-related challenges like reticent employees and third-party witnesses, what constitutes a sufficiently “reasonable” investigation, and how credibility determinations can help the investigator make factual findings in close-call situations. The presentation includes a catered lunch. *Note: We charge for reservations made but not honored and for cancellations received after the reservation deadline of January 16, 2018. We charge an additional $5 for walk-ins, payments at the door and for reservations made after the deadline.